Sunday was Star Wars Day at San Francisco's AT&T Park. 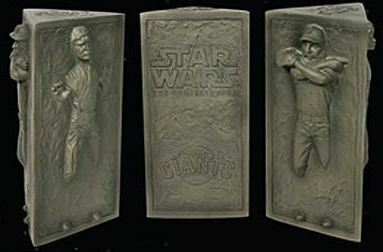 Costumes were worn, The Empire Strikes Back was screened after the game and the Giants handed out the coolest stadium giveaway of the year: Brian Wilson in carbonite. Modeled after the famous section of the original Star Wars saga where Han Solo is captured and turned into a stone wall hanging, the three-sided mini statue features an entombed version of the flamboyant closer with his arms crossed. A second side has the familiar Han Solo, while the third side has logos for both the Giants and Star Wars. Fully licensed, the statue came in a box decorated with Darth Vader, droids R2-D2 and C3PO and a fired up Wilson. Within hours of the game's finish, statues started popping up on eBay and they're moving quickly with several Buy It Now listings ending in the $30 range. With the crossover appeal the statue carries into the Star Wars realm, prices could really take off as word gets out. Full details of the promotion weren't given up until recently so it's likely a lot of people don't know about it yet. Star Wars collectors are some of the most dedicated and obsessive out there, so it's tough to tell where prices will settle. It's also a unique giveaway, which further adds to the piece's intrigue. Although marketed as a limited edition, a production run of the statue hasn't been provided. More statues are going to be made available at the Giants' September 12th game against San Diego. Wired Magazine has a great gallery from the game posted here.